While the economy has improved nationally in recent years, that's not the case for rural parts of Maine. Take Oxford County, for example. More than a quarter of the children in the county live in poverty, and many families struggle with basic needs like food, housing and transportation. Now, one rural school is stepping in to help some of those families by going from the classroom to the living room. For close to a year, Brittany Manzo struggled to find an affordable apartment in Norway, Maine. She's got five kids, so it wasn't easy. Manzo poured through listings, filled out applications. But she says there were few affordable rentals. The family found itself living in a small hotel room for months at a time. "The whole time I just tried to keep things as normal as possible," she says. "It was tough. It was really, really tough. I don't wish it upon anybody." Manzo says much of her income went to paying for the room, making it nearly impossible to afford the up-front costs and security deposit of a long-term rental. She also watched how living in a hotel room affected her kids. Dinner would take hours, cooked on tiny appliances, and crying babies in small quarters led to arguments and sleepless nights. "None of us were getting along. It was horrible," Manzo says. "We just needed to be in a house or an apartment. Something bigger than one room." 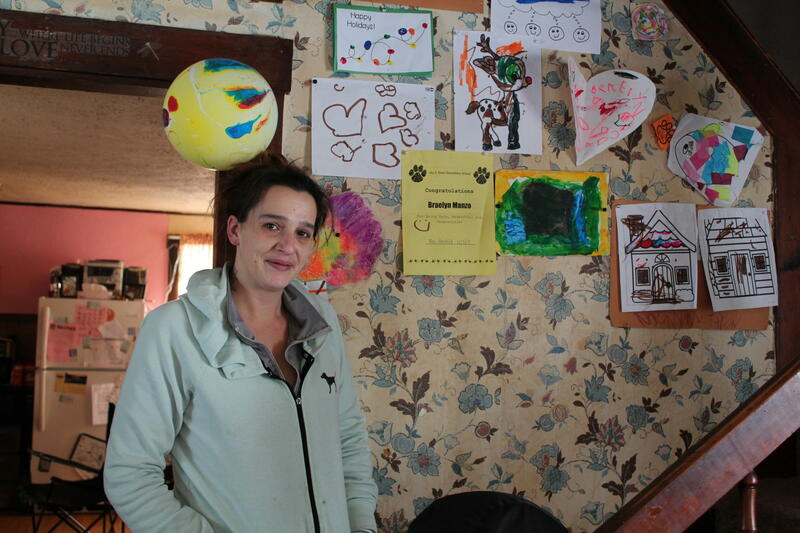 While the situation was hard, it's not unusual for many families in Oxford County or in Maine. Despite a local unemployment rate below 4 percent, many families here still struggle to make ends meet. “We were seeing that impacting our schools," says Rick Colpitts, the superintendent of the Oxford Hills School District. Colpitts says those kinds of issues outside of school make a big difference in the classroom. "Kids were coming in on Mondays without really having a lot to eat over the weekend. Which meant that it was a hard day," Colpitts says. "Kids were coming in, not adequately clothed. And it was because they didn't have a resource, or know where the resource was to access clothing. So we saw families having to make choices." Oxford Hills has tried to ease these burdens by creating school food banks and partnering with social service agencies. In the past that work often ended at the school's walls. But this year, the district is trying a new approach to help families get the services they need outside of the classroom. Early on a recent weekday morning, Whitney Marston leaves the school's grounds and pulls into a small driveway a few streets away. She's here to talk with Brittany Manzo, the mother of five who was forced to live in a hotel room. The two embrace, then Manzo opens the door for Marston to come inside. Marston is what's known at the school as a "family service advocate." Typically, she'll spend a few hours with kids, then meets with parents like Brittany Manzo. And she does it here, at their home. Her goal is to find out what they need. It could be heating, housing, transportation or something else. Combined, these issues can be overwhelming. "There's just tons of different barriers. Every obstacle you can think of," Marston says. "So really trying to sit down with them and figure out, what can we do to make this easier for you?" It was while she was living in the hotel room that Manzo says she found a letter in her daughter's backpack with a note from Marston introducing herself. At first, Manzo was unsure about letting a stranger help her. "Because not only do I have to admit that I'm at a hotel, but that I have five children," she says. "And I've been in there a year. So, yeah. I didn't want people to think down on me. That was what was hard about it." But she did make the call. She and Marston met and filled out housing applications. And after a few months, she found an affordable house, on her own, only a few blocks from her daughter's school. Manzo takes me on a short tour of her new home, showing off the new appliances, the tile she's redone in the bathroom and all the furniture that Marston had arranged to be delivered on the first day she moved in. "So she met me more the first day I moved in with a truck and a trailer. It really, really, helped things out a lot," she says. "Three bed sets for the kids. Coffee pot. A microwave. Dishes. Everything. That you would need to get started. It really was awesome." This kind of home visit program isn't new. It's been used by Head Start preschool programs for decades. And in recent years, cities like New York and Washington, D.C. have launched their own models after seeing the improvements on student attendance and achievement. Despite those results, there is still resistance to programs like these. Carol Gestwicki, who authored a book on family-school relations, says some families may perceive them as judgmental. Earlier this year, some lawmakers in Utah even opposed a teacher-home visit program because of worries over government intrusion. "They're reticent. 'What are they gonna do? Come poke their nose in our business? I don't want them to see all the living room furniture I have.' Those kinds of things," Gestwicki says. That's why Gestwicki recommends training staff and keeping visits informal. "Parents have lots of other kinds of professionals come into their home. And usually it's not good news,” she says. At Oxford Hills, the home visit program is one of the first in the state that's gone beyond preschool and into elementary school. But it's still small. Only two staff members work with families across two elementary schools. The future of the program is also uncertain. It's funded by a grant that will expire next year. But district officials say they're looking for ways to keep it going, given the difference in can make for some families. Manzo says her children are already happier. "So much of a change in them,” she says. “I mean, that brings me in tears. Because it was hard." As she stands in her own living room, looking at her children's artwork on the walls, Manzo says she finally feels happy, too. The Rural Maine Reporting Project is supported by a grant from The Betterment Fund. This story was originally published at 5:39 p.m. Thursday, April 12, 2018.